The older I get the better I become at knowing my strengths and outsourcing the rest! 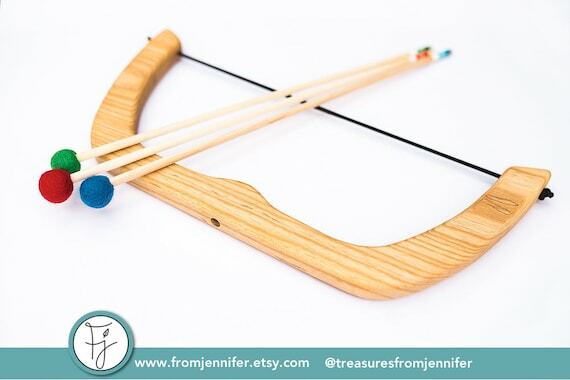 I so admire mamas who make handmade gifts for their children, but I simply don’t have the time or talent to make many of the things I’d like to gift for my kids this year. Etsy to the rescue! There are SO MANY talented makers out there and I am so very happy to support them. I thought it would be fun to make a compilation of some Etsy shops I will be supporting this year, along with those we have shopped from in the past. One of my very favorites! We have had the bow & arrow set for almost two years and it is still going strong. The quality is fabulous and it is still as good as new. The sling shot is also great fun. And we love using the crayon holder, alphabet tracing board and reversible number board in our homeschool. I just discovered this shop at my local Waldorf School’s Winter Fair! 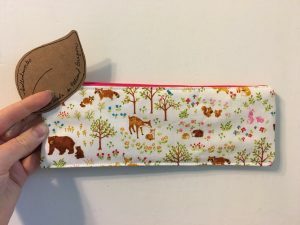 My two big kids will be getting pencil pouches (called a cutlery case on her Etsy site, but perfect for pencils) and I also got the cutest standing snack bag. Technically, I do know how to make Waldorf dolls. I even took private lessons to learn how to make them! But in my current season of life I just can’t figure out how to swing secret doll making sessions in my nonexistent spare time. So I ordered a custom doll from Mimi Hirsch and I just couldn’t be happier with the experience. The doll she made for my toddler is just beyond precious. I’ve never ordered from this shop, but since we’re talking about Waldorf dolls … hers are just stunning. I am ordering my toddler a rainbow stacker from this shop. It is so sweet, and more reasonable than the Grimm’s version. This is another shop that’s here in Portland! I just love her peg dolls. 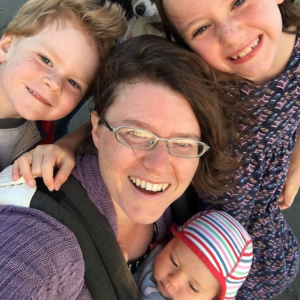 They are definitely several steps above what we can create at home! 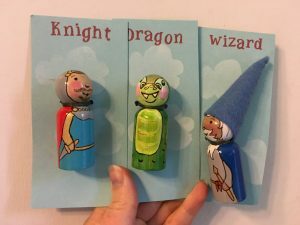 My five-year-old is getting a knight, dragon and wizard. I just love the rainbow bucket bowls from this shop – they are perfect for collecting the flotsam and jetsam that always seem to be covering our floors. We also have the pretty Sun + Rainbow Bowl hanging in our kids’ bedroom. I have had my eye on her apothecary sets for a while now and have also seen some lovely trees for play and our nature table in her shop! Oh I love these baby bonnets! The linen sun hat was well used when our littlest was a baby. If I had a baby on my list this year, I would totally order another one. Yay for another Oregon shop! We love the Rainbow Hand Kites – those would make really sweet stocking stuffers. I gave them out as birthday party favors one year! My toddler is getting a butterfly lacing toy in her stocking this year. 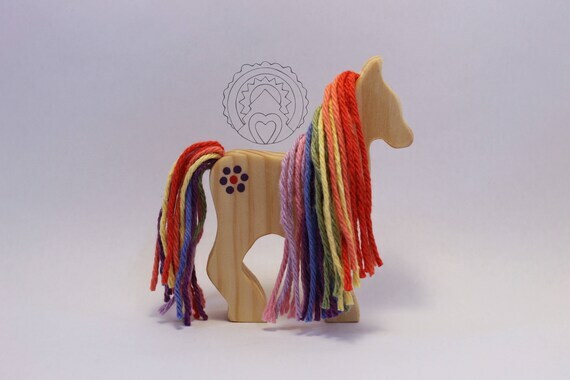 I love the wooden ponies from this shop! One of my kiddos will have one under the tree. Another kiddo is getting this sweet collection of trees for all kinds of open-ended play. Another discovery at my local Winter Fair! This dressmaker lives super close to me. Her dresses were so, so pretty and well-made. Both my girls are getting one and I loved that she had some options that weren’t super girly. 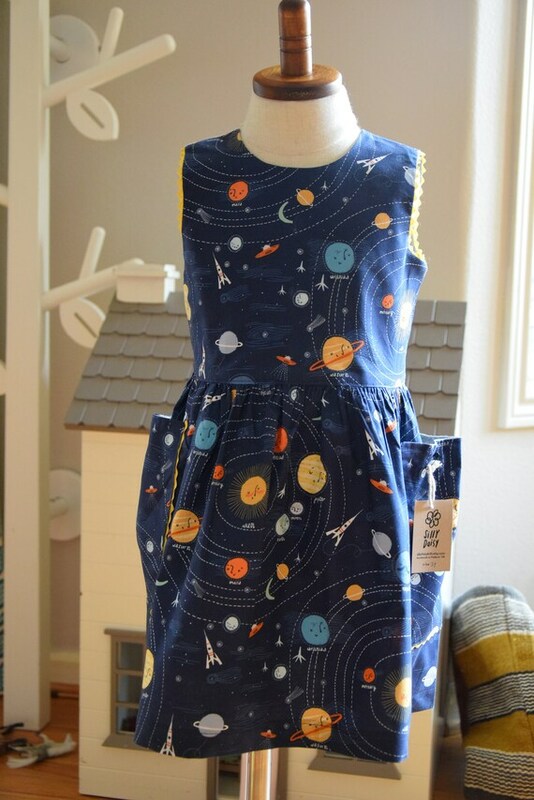 My nine-year-old is getting this space dress! I hope this inspires you to support small businesses. Many if not all of these shops are mama-owned, which is even more lovely. Happy shopping!